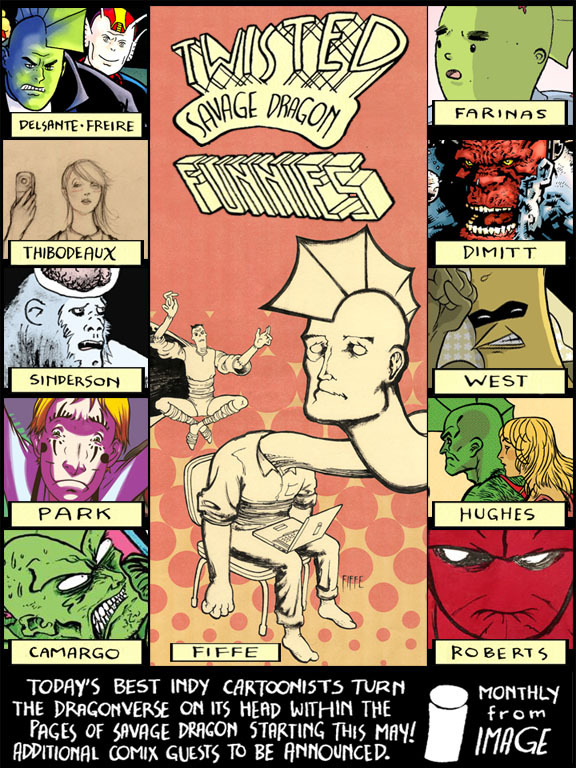 Beginning with Savage Dragon #160, coming out the first week of May, “Twisted Savage Dragon Funnies” hits the stands! Erik Larsen and I are proud to announce this monthly backup feature in the Savage Dragon title. I’ve put together and edited a year’s worth of back up stories featuring some terrific indy cartoonists and I couldn’t be more excited for you guys to see the results! Oh, and did I mention that they’re gonna be flip books? As mentioned in this Comic Book Resources post, we’ve taken a thematic cue from Marvel’s “Strange Tales” and DC’s “Bizarro Comics”. The stories in “Twisted Savage Dragon Funnies” are hilarious, sometimes surreal, always highly personalized and gorgeous to look at. I’m positive you guys will love ’em. Remember, things kick off with Savage Dragon #160, which comes out the first week of May. Ask your local comic shop in advance to make sure you get an order in. If you know folks that do, urge them to go to their local comic shops and directly order Savage Dragon. Although it’s an Image book, there are still shops out there that may not carry the book. Don’t miss your chance to jump on this awesome event! 171 (April). Joe Keatinge, Simon Fraser, Joe Infurnari, Mike Cavallaro, Tim Hamilton, Dean Haspiel, & George O’Connor. I’ll keep the updates coming here or on the Image/Savage Dragon message board.